Photo Booth Hire for Corporate Events in Leeds and surrounding areas. Photo Booths are great entertainment for corporate events, product launches, team building and company parties guaranteed to help break the ice and get people talking. The body of the booth is a perfect advertising platform and we can customise or brand the booth to match your corporate identity. Using either your own designs or by having our in house design team create the ideal customised branding for you. We can also customise the touch screen inside and provide branded green screen or custom backgrounds to provide perfect photo strips as a lasting reminder of your event. Your guests can let there hair down with our fantastic fancy dress box full of wigs, hats, crazy glasses, moustaches and other fun props. 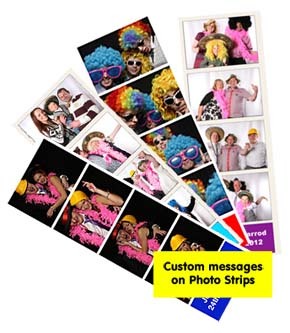 Each guest will recieve a personalised strip of photos as a momento of your event. A terrific way to promote lasting relationships and have a party to remember at the same time. Our photobooths provide unlimited instant prints and video messages using high quality cameras, professional lighting, a touch screen monitor and a box of props including hats, moustaches, wigs, inflatable guitars and much, much more. Anything from the wild west to magical east. An attendant will ensure the smooth running of your corporate event, product launch, team building exercise or company party. Our Booths can be personalised to your Event. Please send me details of your Fun Photo Booth Hire for my corporate event / product launch / team building exercise / company party. 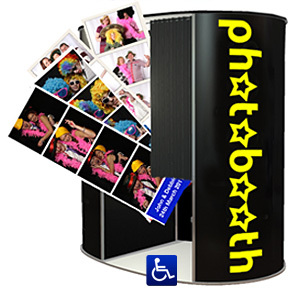 Located in Leeds, West Yorkshire we are ideal for corporate events, product launches, team building and company parties accross the North of England we provide Nationwide photo booth hire.